Gara-gara baca artikel tentang bahayanya terpapar sinar matahari aku langsung cari2 sunblock / sunscreen, plus Lip Balm yg berSPF karena bibir bisa terbakar sinar matahari. 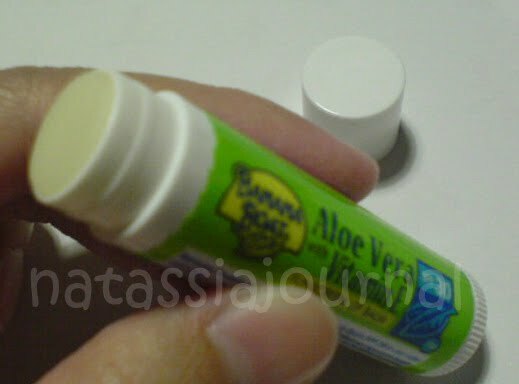 Lalu aku pilih Lip Balm Banana Boat ini. 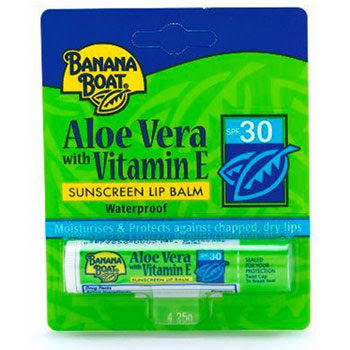 SPF 30 UVA which is cukup tinggi tapi tetep harus re-apply yaa..
Banana Boat Aloe Vera with Vitamin E Lip Balm SPF 30 is very water resistant, helps prevent sunburn and protects your lips from harsh ultraviolet rays. 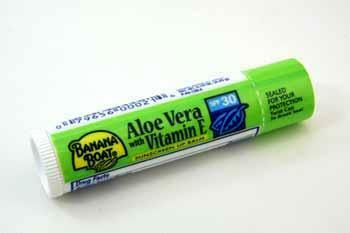 This all season lip protector seals in moisture to soothe and protect against dry, cracked, or wind burned lips. Usage advice : Avoid intensive midday sun. Over exposure to the sun is a serious health threat. Not to be applied over infections or broken skin. Susah banget nyari ini..suer dah..out of stock mulu bilangnya..